Asics’s marketing pitch: Designed to offer maximum comfort and a perfect fit. Upper: Engineered mesh, high-density printing, external heel counter. Midsole: Flytefoam Propel, Flytefoam Lyte, 10 mm heel offset. 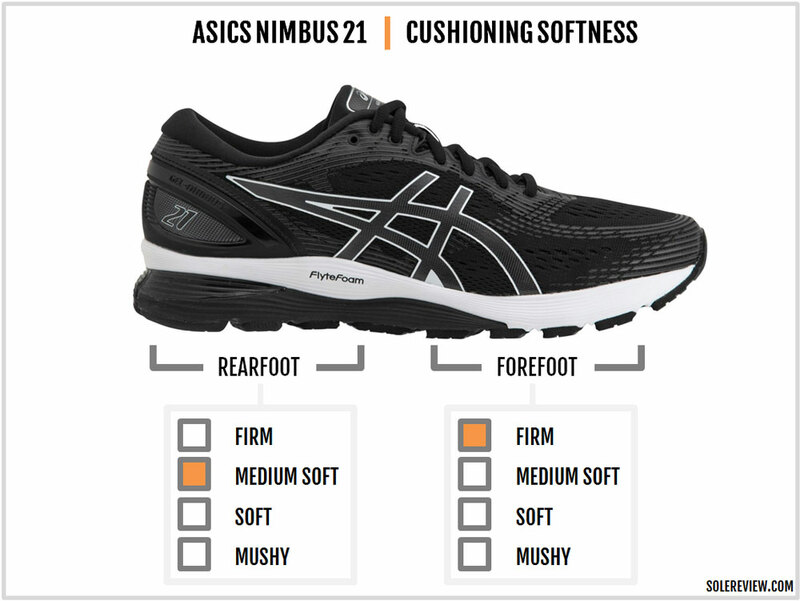 The Asics Nimbus 21 hasn't turned soft - not yet. It does, however, improve its upper fit and feel over the 20. Despite the significant midsole update, the ride quality is still average. The retail price gets a surprise $10 cut. It’s hard for an outsider to decipher how Asics’s product strategy really works. Perhaps there’s a good reason for it – we doubt if Asics knows any better. Else, how would one explain the Nimbus 21? Agreed, the upper is more comfortable and spacious than the 20. But then, the earlier fit needed so much improvement that the only way was up. 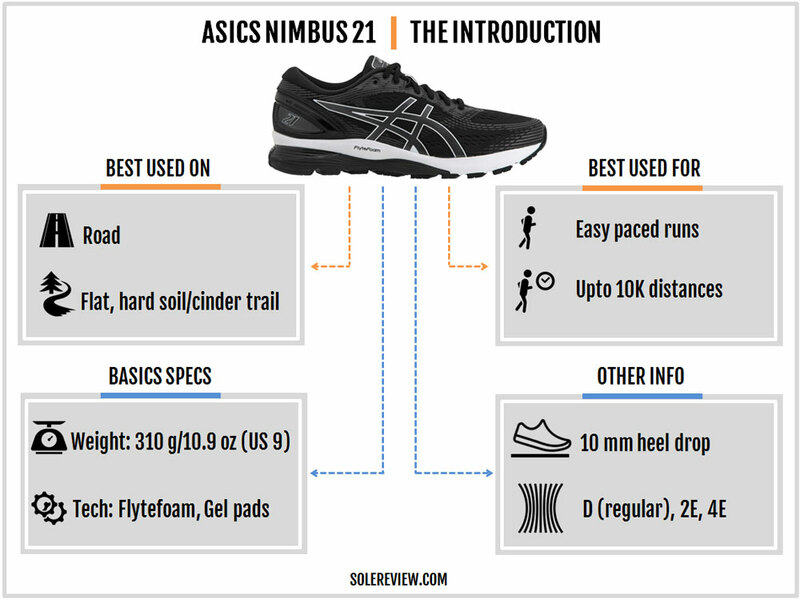 A $150 neutral running shoe should feel special, and the Nimbus 21 does not. The forefoot is stiff and feels disconnected from the rear. The ride quality isn’t engaging, and nobody knows what the Nimbus stands for anymore. One could argue that Asics lacks a credible cushioning technology (coin-sized Gel pads don’t count) and that limits its capabilities. Well, New Balance has a similar limitation but they make good use of what they have. For example, the firm Revlite is used for speed-friendly models while the rebadged EVA foam (Fresh Foam) is the primary cushioning agent for many. Whatever the logic, you need a compelling reason to choose the Nimbus over the others. Even the Asics Cumulus 20 is a better buy. 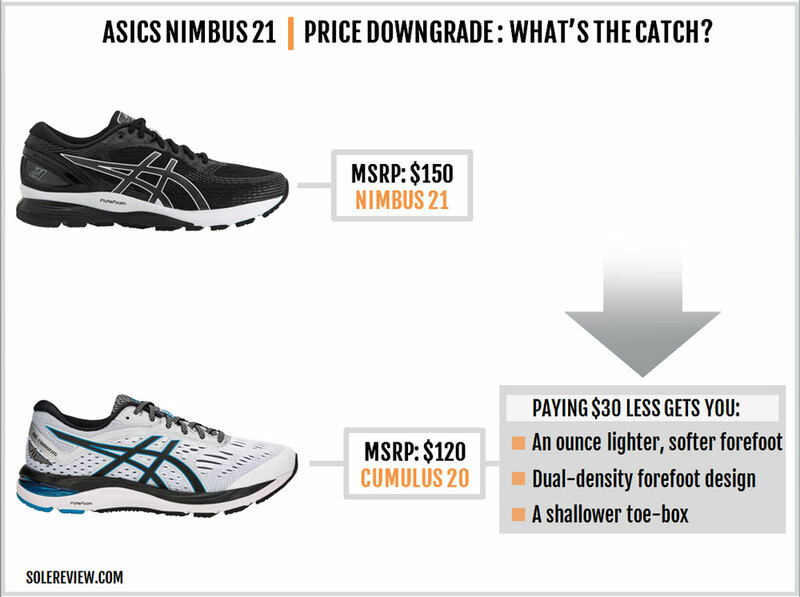 Asics shaves $10 off the Nimbus’s price (now $150), but that doesn’t make a mediocre shoe good. The Nimbus 21 goes the Kayano 25 way with its midsole design. Like the latter, the Nimbus drops the dual-density forefoot and its visible Gel insert. That is replaced by a monolithic chunk of Flytefoam Propel. 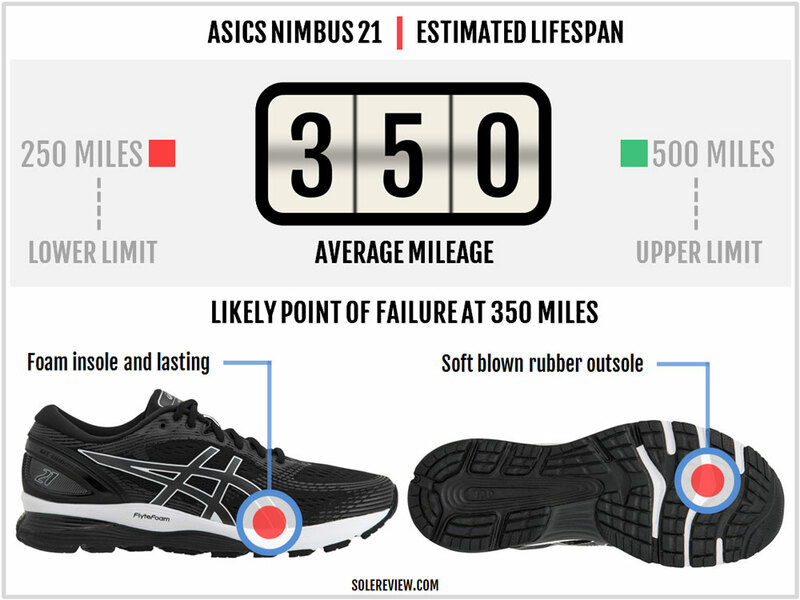 Over the last five years, the Asics Nimbus’s ride has been anything but consistent. The cushioning went from firm to max-soft and then firm again. A firm ride has its place in many shoes, as long as it doesn’t feel like a brick. For example, a firm midsole makes the Asics DS Trainer 24 a good running shoe. It is just that Nimbus was never meant to be a firm running shoe, much less a clunky shoe. All this while, the Asics Nimbus has positioned itself as a comfortable shoe with a soft ride. A shoe not meant to breach personal records or perform high-intensity runs but glide over the road in supreme comfort. Unfortunately, the Nimbus 21 fails to meet its stated goal. It even manages to make the Nimbus 19 and 20 look good. The Nimbus 21 has another problem. 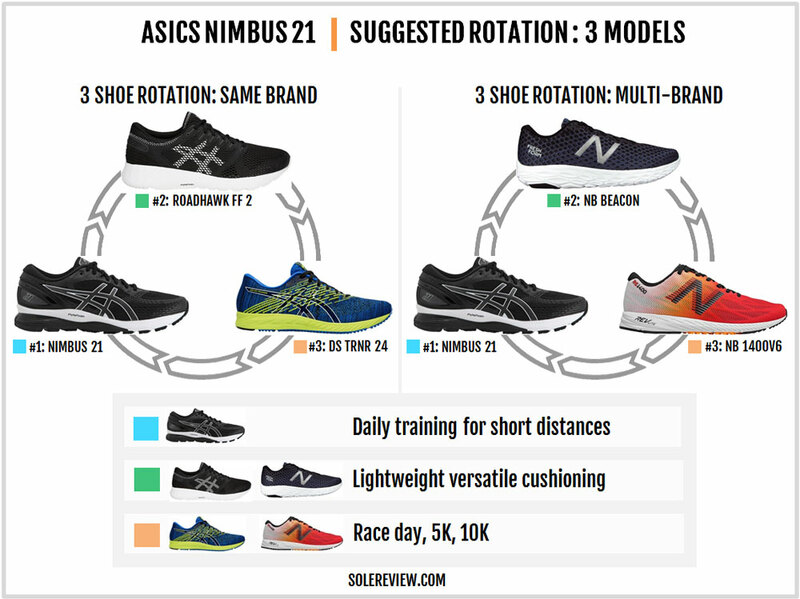 It’s got a boring ride, the kind which will have you looking at solereview’s rotational charts and lists of similar shoes. The ride is clunky and very un-fun. To us, that is a worse crime than a mismatch with its stated positioning. You see, Asics thought it would be a great idea to plug their regular Flytefoam into the Nimbus. Now the standard Flytefoam Lyte shaves off weight and adds durability, but it isn’t the best material for a shoe like the Nimbus or Cumulus. Flytefoam does its job very well in models such as the DS Trainer and the Dynaflyte. The Nimbus 21 uses a different midsole material called Flytefoam Propel, but it doesn’t make a lot of difference. Although, the Propel version is more resilient/dense than the kind used on the Nimbus 20. But bouncy it is certainly not, contrary to what Asics claims. 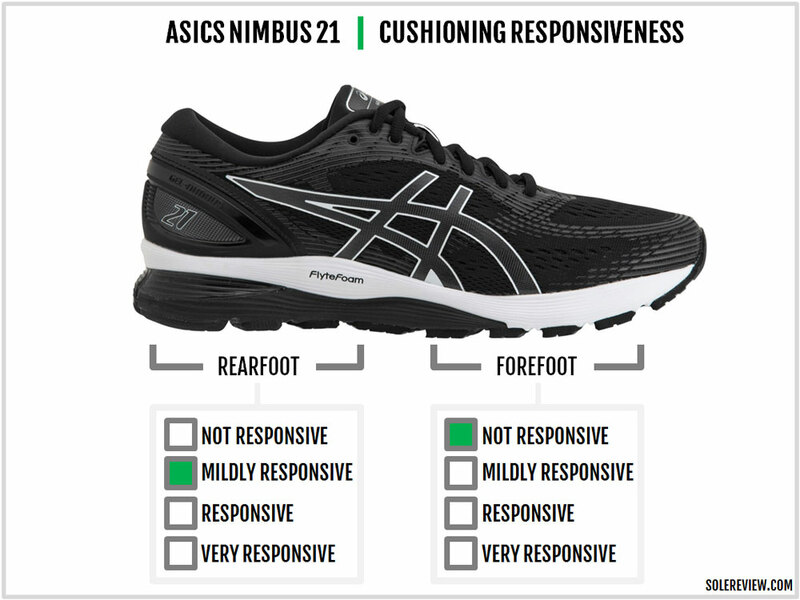 Maybe Asics is comparing the Propel to the Flytefoam Lyte – which is also used as the base layer on the Nimbus 21’s rearfoot. Since the Flytefoam Lyte feels like a wedge of stiff wood, anything else will be softer. This is the first time we’ve seen a Nimbus with a single-density forefoot midsole. It’s also the Nimbus’s first outing without a visible forefoot Gel pad. Not that the visi-Gel will be missed. The forefoot Gel units – both on the inside and outside – were functionally pointless. 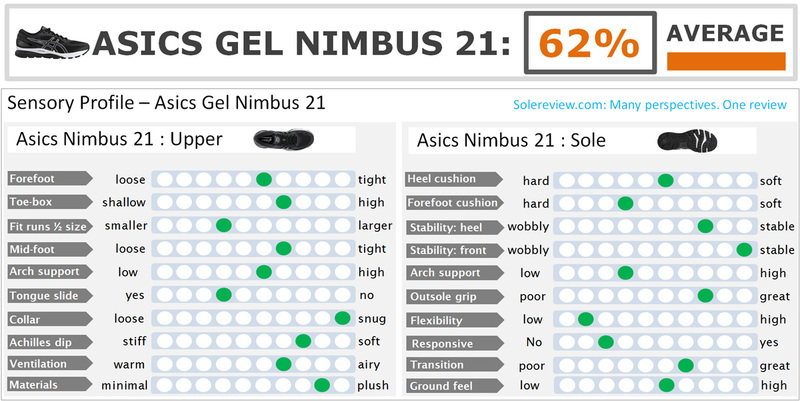 The Nimbus 21 does retain the token-sized Gel pad inside the Propel midsole. With this new update, the thick chunk of Propel foam does most of the forefoot cushioning. This isn’t a squishy foam but firm – see it as Asics’s version of the Glycerin’s DNALoft foam. The new outsole layout has changed over the V20. The Nimbus 21 uses thick slabs of blown rubber which no longer have a ‘Guidance line’ parting them. Of course, this leads to a noticeable difference in the ride character, something which we’ll get to in a bit. The rear looks and feels familiar. The midsole is set-up in a 1-2-3 stack, meaning that there’s a visible Gel piece between the two layers of midsole foam. The midfoot midsole fills the gap where the 20’s plastic shank used to be. On the Nimbus 21, the midfoot stabilizer is now rationed to just the inner side. You get the Ortholite insole and the foam lasting on the Nimbus 21. These layers are what give you the first few millimeters of soft-top cushioning. 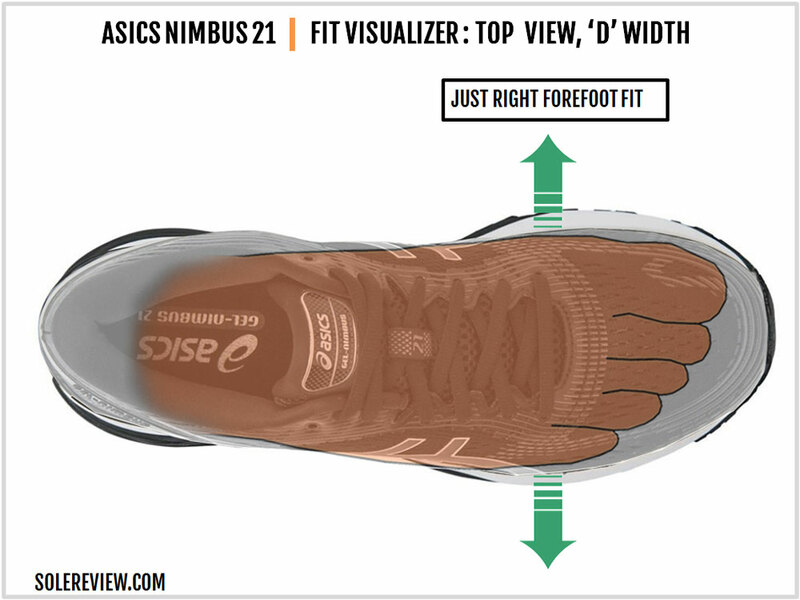 The Nimbus 21’s forefoot is stiffer than the 20. As it turns out, the visi-Gel pad on the V20 wasn’t completely jobless. Just by being the softer component between the Flytefoam layers, the Gel unit made the forefoot more flexible. Getting rid of the Guidance Line and filling the forefoot outsole with blown rubber is the silver lining here. In the past, the lugs on the split outsole used to exert pressure. Asics should have modified this design a long time ago. However, Asics hasn’t let go of the Guidance line completely. There’s a slight indent on the rubber lugs which follow the line of the groove from the rearfoot. This faux Guidance path ends up leaving a large gap between the two rubber slabs. This peculiar design doesn’t affect the ride much. But if you’re discussing durability, then that’s another matter. The overall ride is smoother than the 20. However, the difference is more pronounced in the front than it is under the rear or midfoot. The forefoot has a smoother transition as compared to the 20. The forefoot cushioning experience is cleaner owing to a simple design. The blown rubber works cohesively with the midsole without letting itself felt like a separate layer. 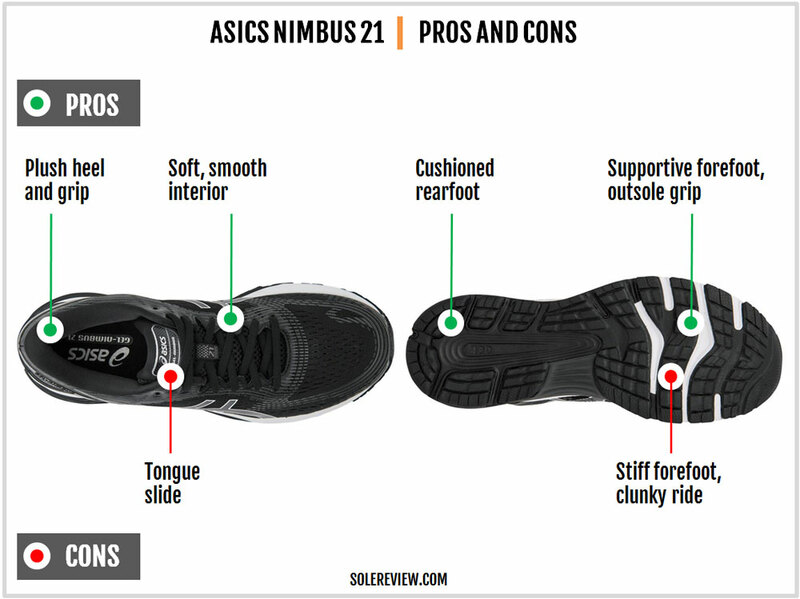 When you run in the Nimbus 21, you sense the difference between the rear-foot and forefoot cushioning. Though the rearfoot foam interlocks nicely with the Flytefoam Propel through the midfoot, you feel the triple density midsole working together. We’re not highlighting this as a negative; a lot of shoes do that. There’s some compression bias towards the outside where the Gel window is, but otherwise, the heel is fairly supportive. Scaling down the midfoot shank makes the ride smoother on the outer side. Rubber fills the gap where the footbridge used to be before so the loading feels better connected. What can you use the Nimbus 21 for? In the past, we would have mentioned long-distance running as one of the use-cases. But of late, one has so many options to choose from, so the 11-ounce Nimbus wouldn’t be the shoe to do it. It’s best that you limit the Nimbus 21’s usage to short runs with easy expectations with regards to the pace. Anything beyond that, and the Asics Nimbus feels like a chore. 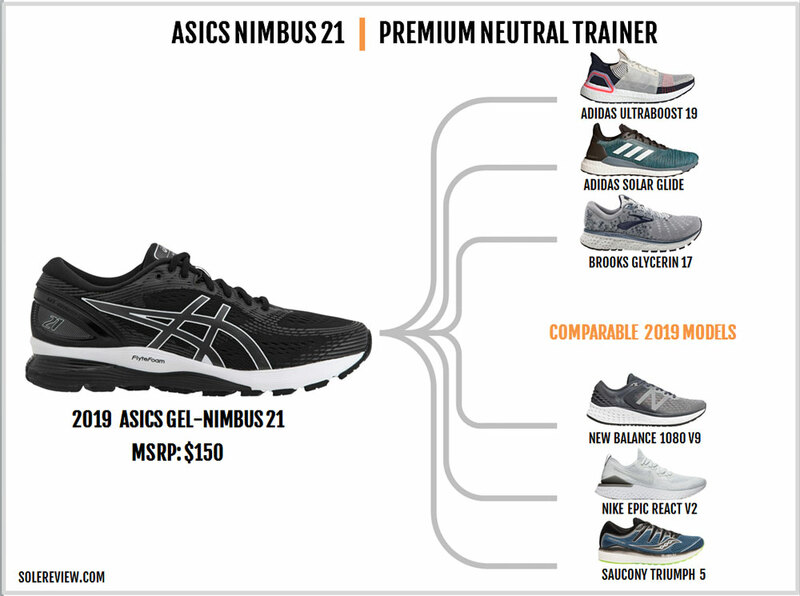 Like we said earlier – buy the Nimbus only if you’re an Asics loyalist. The Nimbus isn’t really good at anything – even the cheaper Cumulus is more fun to run in. Unlike the midsole, the new upper is somewhat deserving of the Nimbus label, and here’s why. The new engineered mesh is soft, comfortable and has more room inside than the 20. The heel gets a new Saucony-type collar lining which wraps below the ankles in plush comfort. The foam-filled tongue lies soft over the foot; even the laces have a nice hand-feel. Unlike comparable shoes like the Saucony Triumph ISO 5, the Nimbus’s sleeveless upper leaves the tongue slightly askew during runs. The heel is plush on the inside and secure on the outside. The Nimbus uses a plastic clip which does an excellent job at locking the heel in. 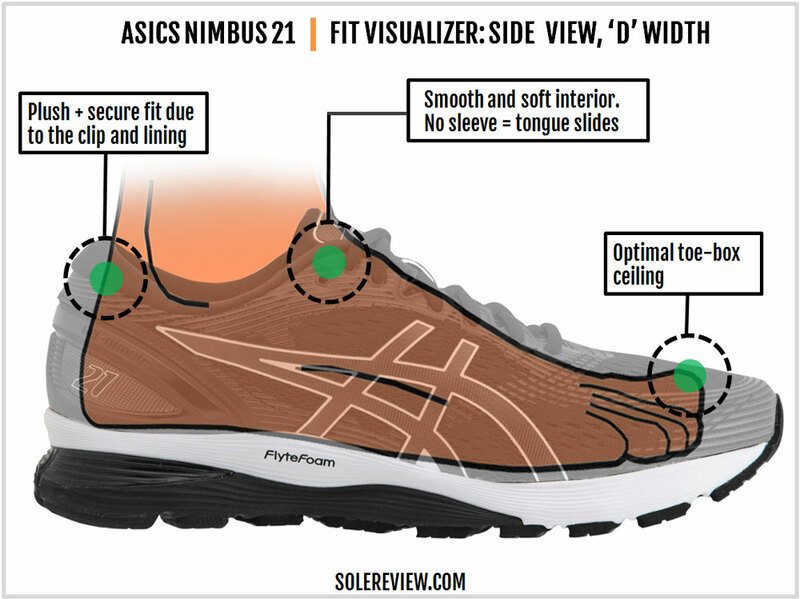 The Asics Nimbus 21’s forefoot and toe-box does have more room and height than the 20. At the same time, the rigid counter and the narrow molded collar tends to move the foot forward. This makes the Nimbus slightly shorter in size, something which was true for the 20 too. We assume that Asics might get rid of this part in the future. But knowing the brand, it’s unlikely to happen abruptly. Maybe Asics will sand it down a little over time, just like what’s happened to the plastic shank and the Guidance line. The high-density printing on the mesh upper is tastefully executed. Not only does do flowing lines match the grooved aesthetics of the midsole, they also support the upper to give it a non-droopy appearance. Due to the irregular spacing between the forefoot flex grooves, wear and tear happens on the edge of the rubber slabs. The blown rubber compound is softer than the heel outsole so it isn’t very hard-wearing either. Combine these two factors, and outsole wear happens on the forefoot first and then the rest of the outsole later. The rest of the shoe isn’t likely to shorten the lifespan; we’ll update this section if we hear from our readers. The Nimbus 21 has a plush upper with all the amenities one would expect of a $150 shoe. The new mesh is softer and more accommodating than the last Nimbus, and other areas like the tongue and heel lining have a soft and padded feel. The heel grip is excellent, although that comes at the cost of a slightly shorter sizing. The Nimbus does not have a sleeve, so the tongue will slide. Making the forefoot out of 100% Flytefoam Propel turns the ride firm and stodgy once you get past the soft insole and the lasting. The Nimbus 20’s ride quality is mediocre and not what you expect out of a shoe perched at higher tiers of neutral cushioning. Pick up the Cumulus 20, and its lower weight is the first thing that one notices. It is an ounce lighter so there you are. When you take all the stats into consideration, it makes more sense to buy the Cumulus instead. The less expensive Asics is certainly more versatile. Its lighter weight makes it a more capable daily trainer and long-distance shoe than the Nimbus. The upper interior lacks the plushness of the Nimbus, but it’s a fair trade for being an ounce lighter. The Nimbus 21 isn’t exactly what you would describe as versatile. 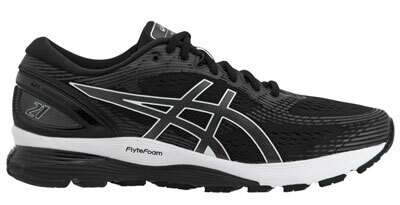 If wanted something lighter from Asics to rotate along with the Nimbus, the Roadhawk FF 2 merits consideration. The Roadhawk’s firm midsole is made of single-density Flytefoam so the ride experience is distraction free. It’s two ounces lighter than the Nimbus so the cushioned Roadhawk works for faster and longer runs. If you want something even lighter, then the New Balance Beacon is an excellent rotational shoe. For road racing, there are a couple of potential paths to follow. The new Asics DS Trainer 24 – yes, we know, it’s a ‘support’ shoe – is a good choice for fast runs and races. Or you buy the Tartherzeal 6 for a serious race-shoe experience, grippy forefoot and all. If you’re not considering Asics, then the New Balance 1400V6 or the Hanzo S V2 are great racing shoes. Many $150 shoes crowd this neutral cushioning segment. If you want a really soft ride, then $180 adidas UltraBoost 19 should be your top pick. The Solar Glide is more performance oriented than the UltraBoost but has a very soft ride. The Nike Epic React V2 Flyknit delivers a different kind of softness, one that is very light and dense. The midsole uses a synthetic rubber blend as its base material. New Balance has updated the 1080V9 with a softer ride and a brand new upper. It’s got a deep, cushy ride with a nice fitting upper. The midsole isn’t made of the latest foam tech but it is a competent running for daily runs and long-distance races. The Brooks Glycerin 17 is a cushioned and supportive trainer with a very comfortable upper. The Saucony Triumph ISO 5’s midsole uses Everun (E-TPU) to make its ride cushioned. It isn’t soft as the adidas Boost – more like 30% firmer.